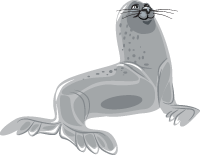 Hi, I’m a 13-year-old seal from Gadget Island, and I’m looking for interesting people of all different ages to talk to. I’m the relaxed, fun and trendy type. My favourite way to spend my time is with friends or shopping. All of my best friends live in the Other World, so I only see them online. But it doesn’t bother me. I do all my shopping there. Who can be bothered to go to the shop when all the cool stuff can be ordered straight to your home, even when you’re lying on the beach? I really like lounging about, on the beach or on the sofa at home, either will do. The only sporty thing I like is swimming. My mum says that my jaw is where I’m strongest, because in her opinion I chew gum too much. But that’s because gum’s pretty much my favourite food. My Mum’s name is Sally Seal, and she is in charge of the Gadget Island Bank. She must have ten different credit cards. Mum has saved the details of one card on my tablet, so I don’t always need to pester her when I’m ordering online. I can buy whatever I want, and usually I order everything I see in the adverts. I follow Marymoo from the gADget advertising agency on InstaMoo, and I get all my best ideas from there. My Dad, Steven Seal owns the Seal Boat Company. Dad’s boats are the only way to get to the island. He loves travelling and he’s always on business trips. Mum used to like travelling. Sometimes when they were young they would both go individually to travel around the Other World, until both by chance ended up swimming here to Gadget Island. There on the cliffs they met each other for the first time, and the place there where they kissed for the first time is still marked. Mum and Dad still go and paddle about there once a year on their anniversary. I want to be able to go and travel around like Mum and Dad did then. I haven’t yet been to the Other World, but I know that I would enjoy it there. I could meet all my friends properly and see how things are over there in the big world. I’ve already suggested the idea to Mum, what if I went along once, when Dad was on a business trip. But Mum said no. She says that I’m too young and that things are too different in the Other World. I didn’t really get it when Mum explained that when Dad goes to the Other World, he always has to jump from the boat and swim to land, so that people don’t panic unnecessarily. Why on earth would that happen? Dad owns the boats, after all! I think that Mum’s making the whole thing up. She’s scared that if I go to the Other World, I won’t want to come back again. And that might happen. I’m going to tell you a secret now. I’ve fallen in love with this really sweet seal. He’s only two years older than me, and I’ve followed him from the very beginning on PopChat. He’s really popular. At the moment he has over 500,000 followers. But since I started to get more followers – over 1,500 already – he started following me! He’s sent me 37 hearts already. I count them every day. I have to be able to meet him. I just have to! I’ve been thinking about whether Walter could take me there. He works for my Dad and is the island’s own rescue patrol. Well, there’s no way I’m going to reveal my plans here. But hey, if you want to chat, you can find me at: Willowy13. You can also find me on WhoWhatWhere and Chatter. Or send me a message if you know a new good instant messaging app! One of my friends was bullied on ChitChat, so I don’t go on there. Byeee!